A gamut is a geometric shape (usually a triangle) superimposed or "mapped" over the color wheel. 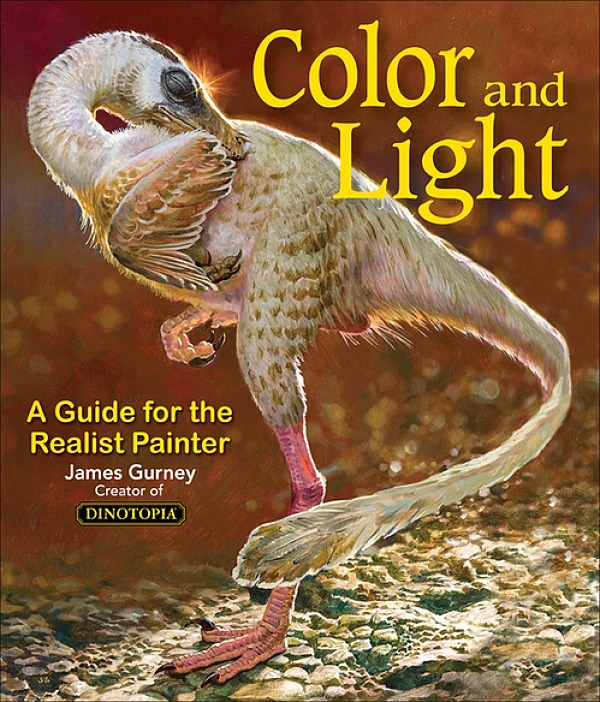 What’s inside the gamut are the colors you’ve chosen for your painting. What’s outside the gamut are the colors you want to leave out. The gamut will contain the full range of color notes that can be mixed from a given set of starting colors. Those starting colors could be the paint pigments you choose for a limited palette. Or they might be a set of custom starting colors, called color strings, which you premix with a palette knife. Any triangular gamut has three primaries, one in each corner of the triangle. These are called subjective primaries, because they may not correspond at all with the full-intensity colors we may think of as primary colors. Yet they are the purest and most extreme colors within the gamut you’ve selected. Note that in the cool gamut above, the purest "yellow" is a warm gray, a mixture of the weak red-magenta and the weak green-cyan. So what looks "yellow" on the Las Vegas sign is really just that warm gray. Premixing is the key to staying within the gamut you want. You define the range of colors, then you mix those colors and use no others. That way, you’ll get exactly the range you want. This method is also a good tool for gallery painters. 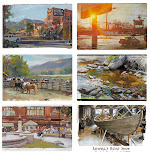 You can bring plein air paintings home and develop them into studio compositions with interesting moods. 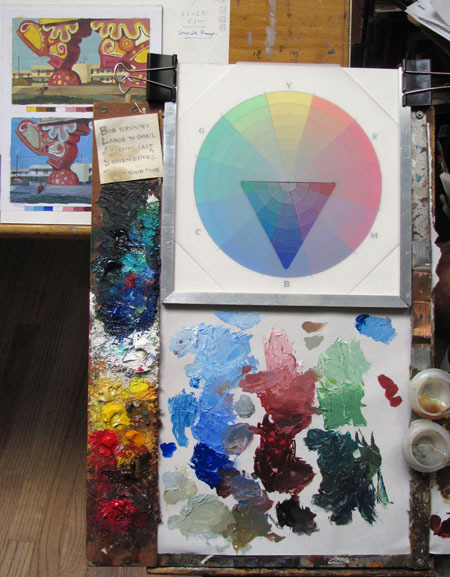 By placing a gamut mask over the color wheel, you can define a very specific range of color for your painting. Tomorrow I’ll show you the method in action with those two Las Vegas paintings. You can order the book "Color and Light" by mail from my online store and get it signed. I'm glad you're going over this one again, because this is the only part of your book that had me scratching my head. The rest of the book excels ar translating complex painting strategies into simple, tangible practice, but this one is still pretty tricky to wrap my head around and put into use. Steve, I know what you mean. It's hard to explain the method using words and pictures. If you check back to the final post tomorrow, I'll have a video that really shows it. I have to say one part of the book I found extremely helpful and useful was the color wheel with most of the major tube paints respectively placed. A friend linked me to this post and I saw immediately that it is what I've been needing desperately for a project. I've put in an order for your book; if it (or part 3) doesn't contain info on the size ratio/relationships between the color wheel and triangle mask? I want to make a digital one in photoshop to use as a palette for aforementioned project. I'm eagerly waiting for tomorrow's installment--Thanks for blogging this! Oops; was intending to ask you for information on determining the size of the triangle based upon the size of the wheel with which one is working! If you have not already covered it, that is. Apologies; I need to proofread more thoroughly! What I was left wondering from the book was: when to use what kind of gamut mask? You talk about triadic palettes, and small rectangular masks, and biased masks with an accent on the other side. Which basically means: use gamut masking to give yourself some color boundaries. So can you talk about what kind of visual feelings the different limits achieve, or is that subjective and each artist must find it themself? Berit, the triangle (also called the "gamut") can be any size as long as it fits within the circle. The smaller it is, the more narrow the range of color. If it's really tiny, the color scheme will be monochromatic. In fact, the gamut shape doesn't have to be triangular. It can be a square or a diamond. But triangles are nice because they give you three starting colors. There's a website by Richard Robinson with a free digital version of this tool He created it based on my blog posts, and it's fun to play with. It gives you a variety of gamut shapes to play with. Alonso, I'd say the best thing is to experiment with two shapes: a triangle set over to one side of the color wheel (as in the photo on today's post), and a long diamond shape that spans the whole wheel. (basically a set of simple complementary colors). Those two give you a nice range of limited palettes. The mood of each has a lot to do with what colors you choose for the gamut when you spin the mask around. Thank you so much for your quick and thorough answer and especially for including the link! I just really want to say thank you for sharing this bit of wisdom here and in the book. This is one of those nebulous things that we self-taught folks know about instinctively from 'looking' at well done art, but have an incredibly difficult time putting into words how to ask to learn about it. You took care of this (and you're one of the only artists I've ever seen talk about it) with these posts and your book. It feels really really good and relieving to finally get some direction about this. 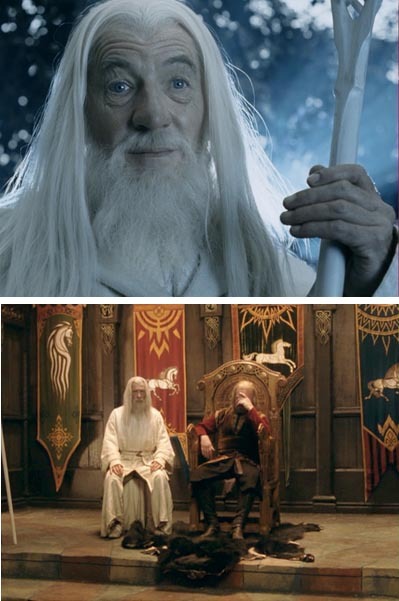 This was absolutely my favorite part of the book - pure genius. Thank you for this insight. I have been playing around with it since reading the book and am very happy with the results. The gamut scheme in your books was most appealing to me but as i am a watercolorholic i still haven´t found out how i could make it work for me with a limited palette without black. Do you know anyone who solved the problem? Thanks so much for the post! I'm planning to paint myself a color wheel in oils to use with gamut masks, consisting of let's say cool and warm yellows, reds and blues (6 pigments). I understand that to paint a wheel I need a neutral grey; what do you usually use as a neutral grey mixture when painting in oils? Tubed or self-mixed, if latter what pigments? Conceptually, gamut masking appears to a much richer notion, but I wonder what's the difference between it and simply adding a little blue, say, or some other color to all the regular colors you lay out? Or to glazing over an entire piece with a single color? I'm a watercolor-er, too, and the idea of a "unifying single-color wash" for harmonizing or melding together too-garish colors in an almost finished piece is commonly bandied about in watercolor books and forums. Seems to me the problems in translating this idea to watercolor have more to do with the many odd rules about palettes that watercolorists for some reason seem very fond of, such as No Black! and definitely No White! and Only Single-Pigment Colors!, than it does with any objective limitations in watercolor paints. An easy way to play with this would be to switch to gouache for a while, using it as if it were regular watercolor, i.e., in washes and much thinned down, instead of flat and opaque. And don't banish white when mixing up your starting, gamut-masked primaries. I suspect his method was some combination of adding blue to all mixes and using a unifying wash.
You can expand the thumbs here, and the colors are possibly closer to the originals, or at least closer to the look of the original reproductions I've seen… And they generally all look much more "harmonized" if not simply duller! David: Digital color wheels often have white or black in the center. Painted ones often have gray, but either way works. A color wheel is a two dimensional representation of three dimensional color space, because it has to slice through the values at some level. Gamuts, if you map them in space, are actually three dimensional amorphous blobs. More on that at couleur.org. Jennifer, hooray for being self taught. Me, too, mainly. I think some schools are starting to teach this stuff. I drew a lot of my inspiration for it from color books from the 1920s, notably the one by Walter Sargent. And yes, it’s all about harmony, not playing all the instruments at once. Maike, of course you can limit the gamuts by the pigments you use. Or, as David Curtis does, you can fill three wells of your paint kit with the three premixed ingredient colors. Ursula, you can mix a neutral gray from almost any combination of colors. It’s good to experiment with mixing complements. You can use black and white, but I think it’s good to arrive at grays from complements and to think of gray as a soup stock or a sauce of many flavors, rather than thinking of it like a 440 middle C. Sorry if that’s too many mixed metaphors. David PC: Very perceptive. Yes, you can limit a gamut by glazing, painting into the soup (which is when you lay wet oil color over everything), or an imprimatura wash, or by photographing with a color filter. All tend to compress a gamut toward one side of the wheel. But premixing to a deliberate gamut is more controlled and deliberate and flexible. Dulac is a great example of underpainting and/or glazing (I guess--I don’t know much about his methods). Thanks for those links! Thanks for the answers. I am not absolutely happy with them but i´ll definitely work on it. Another issue I believe faces watercolorists trying to work with gamut masking: The white of the paper. Otherwise, it'd be necessary to allow no uncovered white paper to show in the finished piece. David, I think that's a great point. I often think of white as the "keying" color for the reason that it reflects wherever the center of the gamut has been shifted in a subjective color scheme. So for watercolorists, a preliminary wash covering the whole surface or a final glaze will simulate that effect. Photography is an interesting case, too, because you can shift or compress the gamut with colored gels or filters over the lights or the lens, but a bright enough source will overwhelm the sensors or film, clipping the image to a pure white, regardless of the tonality of the rest of the image. Will there be a french translation of your book, or may I buy this original english one now before it's too late to get it? No French translation yet. We hope to have one some day! is there an easy way to get a gamut from a given image other than hand selection of colors? it would be awesome if someone would write a program that would do this for us. any ideas? Hi James, thanks for all the great information you post and the things you share with us. I'd like to ask you if you could tell me where I could buy color strings from. I remember you had a post photographing the sky with the hvc stings next to the sky... where do you usually get these charts from please? Luca, you can pick them up for free at a home/hardware store. They're just interior paint samples. Love the work you have done, great contribution to art in general!